For Jenson Button this recent speculation over his future with McLaren for next season must feel like a really bad case of deja vu. This time last year he faced the same mounting speculation over his future, which was not settled until early December. This time around he will be pleading with the McLaren team to make a decision as to his future a lot quicker than last year. It seemed very much in the balance last winter as the McLaren team exhaustively deliberated who would be the best choice to partner the incoming superstar Fernando Alonso. With the new Honda engine package for this year, it was decided that the vast experience and great relationship Button has with Honda swung the drive in his favour. This forced promising rookie Kevin Magnussen into the reserve driver role for this year, however with Belgian protege Stoffel Vandoorne blitzing the GP2 field McLaren now has a serious driver logjam on it’s hands. Whilst the team has the most high profile driver line up in F1 outside of AMG Mercedes and Ferrari, the McLaren pairing of Fernando Alonso and Jenson Button will not be a cheap option for the team. This is becoming increasingly important as McLaren has struggled to return to race winning form since the end of 2012. McLaren team principal Eric Boullier commenting recently how the team’s struggles this year will hugely affect their future revenue streams. The team are currently ninth in the F1 constructors standings, which will represent a drop of $15 million dollars compared to their fifth place finish last year. Their lack of results will also make it a lot harder to attract potential sponsors. This is something the team has struggled with since it lost title sponsor Vodafone at the end of 2013. 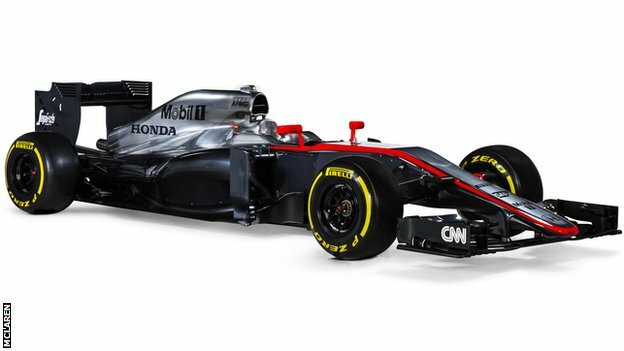 The McLaren-Honda car for this year, noticeably devoid of major sponsors once again. Photo credit thanks to McLaren.com and BBCsport.com . Jenson Button reiterated his commitment to F1 last season when he took a pay cut to re-sign with the team for 2015 and 2016. Therefore it seems strange that speculation is still mounting recently as to his future when he has a contract in place for next year. Also Button will be kept up to date with any negotiations with Vandoorne as he co-manages the young Belgian driver. With Fernando Alonso still the best overall driver in F1 McLaren are not going to drop him any time soon, this leaves Button on the hot seat should McLaren feel they need an injection of youth in their driver line up. Whilst this may prove to be an illogical move at this present time with Honda’s inexperience with these new, highly complex power units. Surely Honda will need the vast experience of both Alonso and Button to help in their mission to catch up on the likes of Mercedes and Ferrari who have several years head start on them in terms of these power units. If Button is retained for next year this leaves McLaren with another issue. What can they do with Magnussen and Vandoorne? Magnussen showed good promise in his rookie year last year, and has a stellar junior single seater record. Magnussen has already stated earlier this year he cannot do another year of not racing and sitting on the sidelines. This will likely force McLaren to try and find him a drive with another F1 team, which will prove very difficult. The team faces the same issue with the GP2 champion elect Stoffel Vandoorne. He has impressed in every junior racing category so far, and has exceeded McLaren’s expectations for him to win the title this year. He’s dominated the field with consistent podium placings, and he currently sitting a whopping 108 points ahead of fellow F1 hopeful Alex Rossi in 2nd. Surely Vandoorne will be in F1 next year, it’s simply a case of which team he will be driving for. Stoffel Vandoorne in action in a dominant GP2 year for the champion elect. Thanks to Motorsport.com for the high quality photo. For McLaren they face a very tough decision over the coming months, as they have four legitimate F1 drivers yet only two seats to house them. With Fernando Alonso a cert for next year they now must decide if they are to honour Jenson Button’s contract for next year and retain his vast experience and speed. Or will they instead go with the young contender who appears destined for F1 in Stoffel Vandoorne. Kevin Magnussen is also waiting in the wings, although for McLaren, two of their drivers are likely to be disappointed by the time the new F1 season is rolling around next year. Who should McLaren retain? Give your thoughts in the comment box below. Whilst teams like AMG Mercedes try to work out how best to keep their drivers in line next year, and others like Red Bull and Ferrari adapt to new driver line up’s, McLaren currently have the best driver problem on the grid for the next few years. Whilst today’s announcement of Fernando Alonso and Jenson Button will lead to questions as to how the two, and especially how Fernando Alonso and Ron Dennis can work together effectively after a tumultuous 2007 season. The team now has an extensive amount of experience which will greatly help the Honda engineers in their debut season, with two very quick young drivers waiting in the wings for the future. Alonso returning to McLaren for next year would have been laughed at before the 2014 season, however this shows how crazy a season it was as Alonso managed to escape a Ferrari team in transition, with a return to McLaren providing promise of potential wins and further championships for the 33 year old Spaniard. His return to a McLaren team once again spearheaded by disciplinarian Ron Dennis will be an interesting sub-plot to the 2015 season, however both have matured and changed since 2007 therefore a return to the days of a broken relationship between the two is unlikely to occur. As for Jenson Button, he was forced to sit on the sidelines and wait for an extraordinary amount of time as McLaren deliberated over whether to retain his experience for a crucial first year for the new Honda engine next year, or whether to start planning for the future by placing promising rookie Kevin Magnussen alongside Alonso. This morning McLaren finally announced their decision to retain Jenson Button, although it appears he’s been forced to take a pay cut for next year and it’s rumored the team have signed him to a one year deal. All smiling faces at today’s announcement as Alonso and Button are confirmed at McLaren-Honda next year. Whilst both Fernando Alonso and Jenson Button will be thrilled everything is finally confirmed, meaning they can now fully focus on the 2015 season and the beginning of a new works partnership with Honda, McLaren will also be rubbing their hands with glee over both their current plans extending into the future. For the next few seasons, the team arguably has the best driver line up in F1 with three world championships and 27 years of F1 experience between them going into the 2015 season. This experience and competitive determination will greatly benefit the development of the new Honda turbo next year. Going into the future with a driver line up comprising 33 year old Fernando Alonso and 34 year old Jenson Button, McLaren have clearly been forced to plan for the future when these two incredible drivers decide to retire from Formula One. This is the brilliant problem McLaren have as they already have two very quick young drivers on their books who could adequately carry on the McLaren-Honda project in the future. 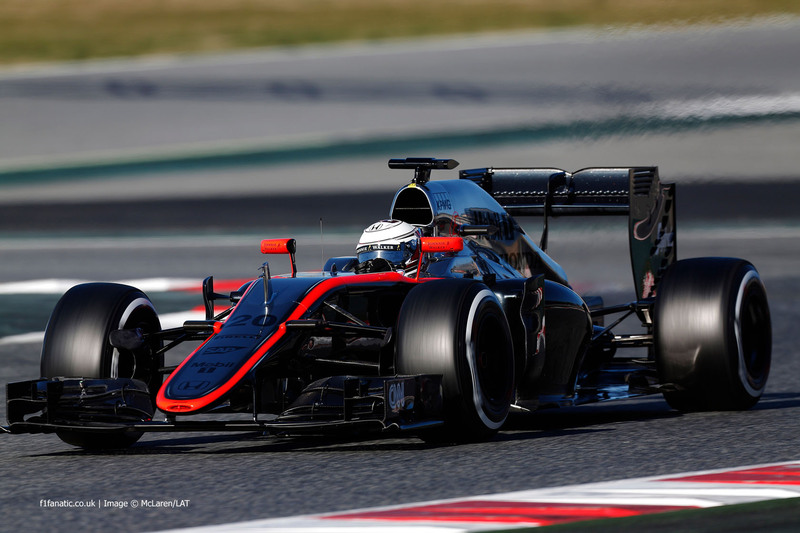 Kevin Magnussen in action for McLaren during the season ending Abu Dhabi Grand Prix last month. Kevin Magnussen had an impressive debut season in F1 this year, and whilst we rightly feel hard done by that he’s not on the grid next year, will be aware of the wider implications and the opportunity he has at McLaren if he stays in his current position for a year or two more. Alongside Magnussen McLaren also supports the highly promising young Belgian driver Stoffel Vandoorne. Whilst that name won’t mean anything to the majority of casual F1 fans, Vandoorne has impressed in every category he’s raced in, including a hugely impressive 2nd in the standings during his debut year of GP2 racing this year. A second season in GP2 looks the most likely option for him with his objective surely to dominate and win the title. From here a reserve driver role with McLaren is likely until either Alonso or Button is replaced by Vandoorne to partner Magnussen. Stoffel Vandoorne in action for McLaren-Honda during the post season test in Abu Dhabi last month. For all concerned it seems today’s driver announcement is the start of a new, successful era as firstly McLaren and Honda both benefit in the short and long term. The experience Alonso and Button will bring will be invaluable, whilst the team has two quick young drivers to replace them when the timings right. For Alonso and Button it gives them fresh hope about a revival at McLaren after two unsuccessful year with the promise of wins and championships enough to keep both motivated. Finally for Magnussen and Vandoorne it gives them hope regarding the potential of the team they are both likely to drive for in the next few years. Both will miss the development phase of the project and will likely both come in when the team is ultra competitive. Put simply, with today’s press announcement, McLaren may have just revealed it’s plans for F1 success for the next 10-15 years. The 2015 season will now be even more eagerly anticipated. Announcement photo – Photo credit goes to http://www.Mclaren.com with extra credit going to http://www.Motorsport.com also. 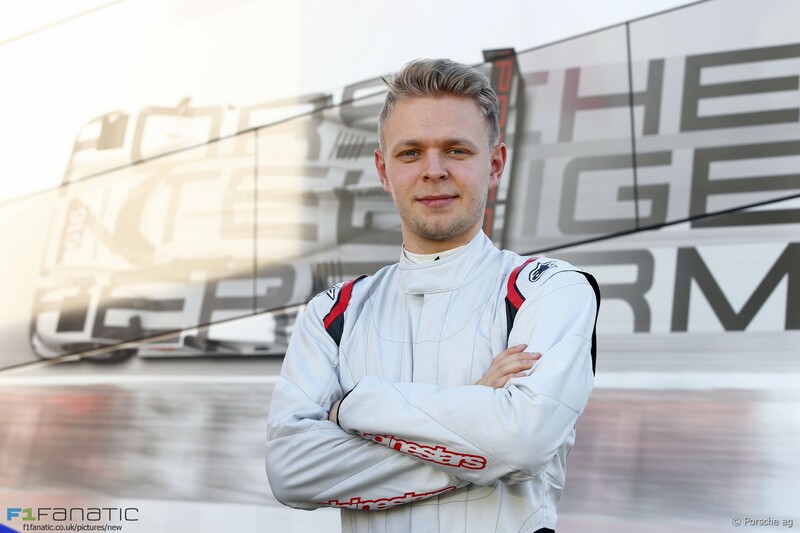 Kevin Magnussen photo – Photo credit goes to XPB images, with special credit going to http://www.Motorsport.com. Stoffel Vandoorne photo – Photo credit goes to XPB images, with extra credit going to http://www.Motorsport.com also.